Nintendo has officially begun promoting its upcoming 3DS release, Animal Crossing: Happy Home Designer, due out in Japan at the end of July. The two ad spot commercials highlight the seemingly endless amount of design possibilities featured within the title. In addition to this, the Happy Home Designer pre-load is now live on the Japanese 3DS eShop, revealing the digital copy will take up 4,038 blocks of space. Let us know if you’re excited for the release of Animal Crossing: Happy Home Designer on 3DS in the comments below. That looks pretty cool. At least they are advertising it more. Useless title. Should have kept as DLC for Crossing. I doubt there would be lots of content to a game focusing only on the house design but new leaf is such a great game, i might just give this a try. I might get the new 3ds just for this and youkai watch, oh chibi robo too. I'm interesting in learning more about designing buildings like schools and restaurants, are these special and do they have more functionality or purpose? My God, I need this game...but why?! Damn you Animal Crossing logic! In the game overview, why is the genre Adventure, shouldm't it be simulator? @Tsurii Wait, are those amiibo cards in blind packs or something? I'd think the stock wouldn't be as much of an issue as the figures, but I suppose I've seen stranger things. I dunno 'bout you guys but this is looking very promising. @Zyph Yeah, I'm way more interested in this now than when it was first announced. i wasn't sure about hhd (even tho i spend most of my time in acnl messing about with furniture). super excited after seeing this! and pleeeeease, Nintendo, can we get that awesome ac new ll/xl here in north america? my wallet is ready! Really can't say I see the appeal of this one in the slightest... and I like Animal Crossing. Plus those cards just seem like a no effort cash milking machine. I hope the people looking forward to it for reasons I can't fathom enjoy it though I suppose. Why does this even exist as a full game? It would be great as some dlc expansion, but as a full game... i just don't see the appeal. Can't wait!!! So glad that you don't have to get the amiibo cards to enjoy this game! Seems like a fitting spin-off for the series! @NightmareEater I wouldn't say it's useless, but I hope they'll integrate this into future Animal Crossing games. It would be fun if you could have jobs in AC. @IceClimbers Yes, Wave 1 comes out on July 30th (launch day) and consists of 100 cards. Each pack cost 300yen and will have 3 RANDOM cards in it. Wave 2 comes out September 10th and again consists of 100 cards. AGAIN each pack cost 300yen and will have 3 random cards in it. This is obviously all for Japan, but I'm sure it will be the same outside Japan. Aaaaaa Im soooo excited about this game you have no idea. Interior design is my jam. Thank you! This info is very helpful. Blind packs or not I will purchase. I can hardly wait for this sim. @MightyKrypto I feel the same. This looks like the type of home management game you'd find for free on mobile devices. If it's literally only focusing on making interior designs then ehhh... I don't think it's worth it. As someone who ADORES New Leaf, I will not be purchasing this game. As previous users have stated, this should have been DLC for New Leaf. This game should just be a free download if you have to buy all that Amiibo garbage in order to enjoy it. I've been a gamer for decades and I am so sick of all these money-making obsessions that game developers have these days, I'm seriously considering just giving up on ever buying new games again. @Kiyata_Hamasaki This is nothing new. Gaming companies have always been obsessed with making money and have constantly done things over the years to make quick and easy money. Even from the beginning. I wasn't sure about this when it was first announced but now I'm much more interested. I agree, it should've been DLC or free to play but considering the amount of content it no doubt has, I'm happy to shell out a few pounds. My only concern is will we, in the UK, ever get the cards since almost every time a game has launched that uses cards in some shape or form, we either never got the cards or they were VERY hard to find (biggest examples being that iOS Tekken card game and Kid Icarus Uprising, I never saw the cards in stores!)? @Aromaiden the only thing in the past that resembled this money making obsession was the arcades of old that sucked the quarters by the hundreds for millions of teens in the 70s and 80s. And I'm happy to say I never fell for that either. I was a computer game programmer in that era, and also enjoyed the home consoles. Never one to pay per play or fall for the current statue craze (Amiibo, Infinity, etc.) These tactics in the past were always last resorts to try to save a failing game industry. And they ultimately accelerated the demise. @Kiyata_Hamasaki "And they ultimately accelerated the demise." Not really. The game industry's still thriving, just not within the same format it once was. Times change and so has the games industry, it's not a sign of a demise, just a sign of change. @Kiyata_Hamasaki Not really, if companies in the past had the opportunity to make quick money, even if it exploited their consumers, they would practically always do. Nearly all companies that want profits are "money-obsessed", and although in the past they may not have had things such as Amiibos they did do some cheap tactics. Whether most people noticed them is a different thing. One well known example of this would be when companies like Nintendo would use a business tactic in which they would purposely hold back supplies such as games and consoles, in order to charge enormous prices on the available ones. Game companies have always done cheap tactics to "milk" the money from their fans and consumers, and frankly saying that they rarely did these kinds of things in the past is a bit of lie. By the way, as far as I'm aware this game does not require Amiibos. 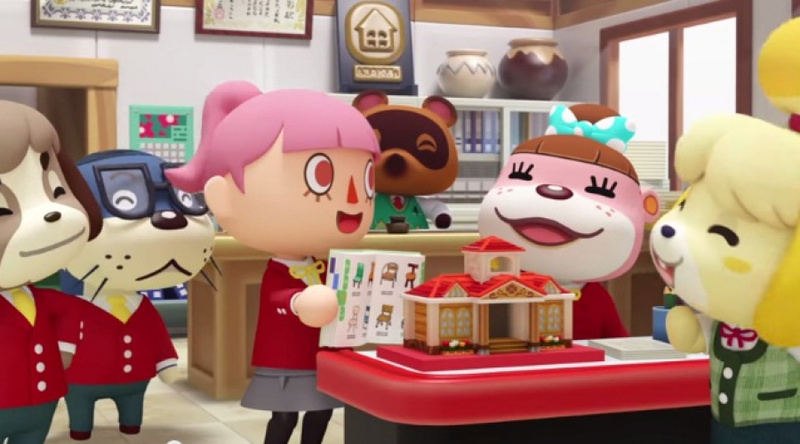 The game your thinking of is Animal Crossing: Amiibo Festival, and that game is free. @Aromaiden Exactly, then there's the whole thing with gaming merchandise which also exists purely to milk money from consumers who see their favourite game characters and logos plastered onto items they could buy under any other name but won't. I'll admit I'm always falling for that tactic myself as I collect Pokemon plushes and Sonic figurines as well as anything else Sonic-related. But you don't need the cards to play the game. They have been saying that since it was announced. The cards are completely optional. Animal Crossing is not the only franchise to have spin offs. I don't see the big deal about this. Actually, the video game industry did indeed collapse in the mid 80s, between the 4 bit era (Atari, Intellevision), and the revitalizing 8 bit era (Nintendo, Sega Master System). And then Nintendo nearly went down again after the Game Cube, until Iwata saved them. But the direction Nintendo is going now has no potential to be profitable in the long term unless they stop these money making gimmicks they are obsessed with now. @Kiyata_Hamasaki Actually, these "money-making gimmicks" are making them plenty money right now because they're collectables with some of the biggest faces in gaming on them which also happen to add content and replayability to a whole host of games. They're not JUST going out of stock so quickly because they're in low numbers, you know. If they weren't making Nintendo any money, they would still be gathering dust on store shelves instead of circulating sites like eBay and Amazon or sitting on collectors shelves and being used for their intended purpose, all of which involve, at some point, money going to Nintendo. To those complaining about the cards being in blind packs, my Animal Crossing Gamecube E-Reader card collection says hello. And you know what? I'm happy they are blind. maybe that will help curb scalping of SUPER popular characters. @Kiyata_Hamasaki There was no "4-bit" era, just different generations of 8-bit. None of the consoles you mentioned are 4-bit consoles - there were no 4-bit home consoles. The Atari 2600 uses an 8-bit cpu with 8-bit system bus, the Intellivision is actually 16-bit. Bitness has nothing to do with graphics capabilities, that's up to whatever capabilities the graphics processing chip provides. Hence Atari 2600 to Colecovision to NES are all 8-bit with very different ways of doing graphics between each.